Building block party favors are perfect for a building block party or a construction themed boy birthday. 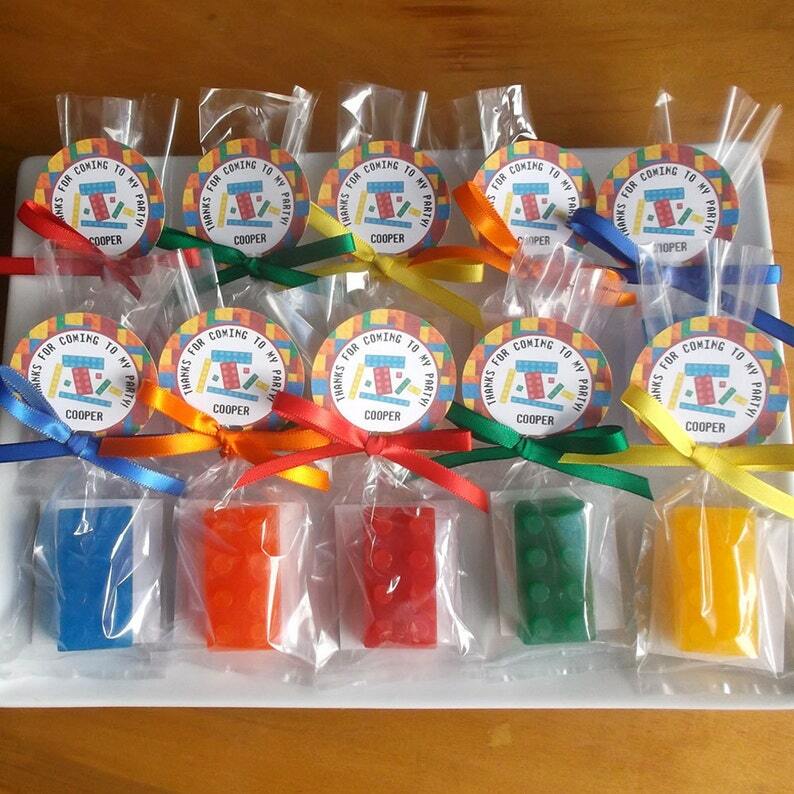 Building block party favors are also great as back to school favors or end of school favors. Great as a teacher gift to students as a back to school favor or end of the school year favor. Perfect as kindergarten or pre school favors for kids. Building block soap favors come in assorted colors and are scented with birthday cake, a rich creamy vanilla and cake mixture. These fun building block soap favors for kids fit right in their hands and are great for encouraging them to wash. Includes tags. Assorted colors. Assorted ribbon colors. Packaged in a cellophane bag with a ribbon, "DO NOT EAT" tag and tag. 1) Your party date to be sure they arrive in plenty of time for your event. Ingredients: Glycerin (kosher, of vegetable origin), Coconut Oil, Palm Oil, Safflower Oil, Purified Water, Sodium Hydroxide (saponifying agent), Sorbitol (moisturizer), Sorbitan oleate (emulsifier), Oat protein (conditioner), Fragrance, Titanium Dioxide, Red 40 Lake, Yellow 6 Lake, Yellow 5 Lake, Blue 1 Lake. Perfect!! Quick shipping and great service, THANK YOU!!!! !